Supreme Court orders incineration of Bhopal's toxic waste at non-functional treatment facility in Dhar district. Read full text of this order by the apex court. 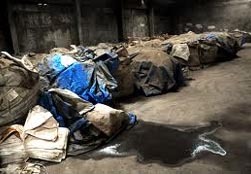 Almost every study done to measure the impact of the waste dumped within and outside the site by UCIL has come up with one conclusion there is large-scale contamination in the soil and water of the area where the factory is located. In the first initiative of its kind, New Delhi-based research and advocacy body Centre for Science and Environment (CSE) has analysed all the studies and their conclusions. CSE released the key findings of its analysis and also released a comprehensive action plan for ridding the site of this contamination. SC gave 6 months to the Central and the MP governments to dispose of toxic waste lying in and around the abandoned Union Carbide factory in Bhopal for the past 28 years. Read this order. Feature: Bhopal - a toxic legacy. Fact Sheet: Toxicity of waste. In-Court: US court on Bhopal Disaster. In-Court: MSC order on disposal of toxic waste. Opinion: Young India's Bhopal challenge. Report: Health effects of the toxic gas leak from Union Carbide. In-Parliament: Discussion in Lok Sabha. In-court: Supreme Court order on the disposal of toxic waste lying in the factory of Union Carbide India Ltd dated 04/04/2012. 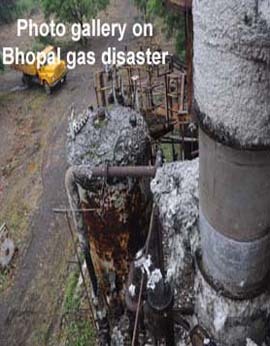 In-court: United States court order on Bhopal Gas Disaster dated 26/06/2012. In-court: Supreme Court order on Bhopal waste disposal, Jan 28, 2010. People in Indore and the adjoining Pithampur industrial area in Madhya Pradesh are protesting the incineration of Bhopal’s toxic waste near their homes. The waste disposal facility in Pithampur in Dhar district was completed recently. On March 18, the Madhya Pradesh state pollution control board allowed Ramky Enviro, the private company operating the facility, to start trial runs. The National Green Tribunal Act 2010 approved by the President of India on June 2, 2010. It provides for establishment of National Green Tribunal- a special fast-track court for speedy disposal of environment-related civil cases. Bill to provide for civil liability for nuclear damage, appointment of claims commissioner, establishment of nuclear damage claims commission and for matters connected therewith or incidental thereto. This fact sheet includes research on waste at the Union Carbide factory and what it has found. This fact sheet contains what is being done regarding toxic waste at Union Carbide, Bhopal. 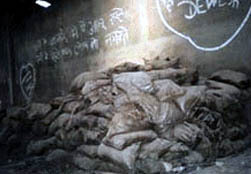 This study was conducted to assess the safety with special reference to acute toxicity, if any of six samples (Excavated waste, Lime sludge, Naphthol tar (or Naphthol tar), Reactor residue, Semi processed pesticide and Sevin tar) collected from `Stored Toxic Wastes at the former UCIL plant site at Bhopal'. Did the Indian government guarantee Dow Chemicals, the parent company of Union Carbide, that it will not be held liable for the Bhopal gas tragedy? On the night of December 2, 1984, forty tons of deadly methyl isocyanate leaked out of a Union Carbide pesticide factory in Bhopal, India, killing thousands and injuring many more. The deaths in Bhopal caused by Union Carbide's noxious fumes should not have happened at all. Equally unnecessary and unwarranted is the continuing suffering of those who managed to survive. Situations that caused a tragedy of such magnitude could and should have been averted.